Last month I had the opportunity to write my first sponsored post on my mommy blog. (Check it out here!) I was lucky, I didn’t really have to go out and find the opportunity. I attended a blogger’s lunch to preview the product in March 2018 and they emailed me a couple months asking if I wanted to write a sponsored post. I jumped at the opportunity! I was a little nervous because I wanted it to be an AMAZING post, but I was mostly excited because I love this product and it would be easy to write about. I’ve been following Ruth Soukup’s motto, do it scared, so I just said yes before I could talk myself out of it. *DISCLOSURE* This post contains affiliate links. I will receive a small commission if you purchase from these links, at no extra cost to you. You can read more about this on my Disclosure Page. I wanted to do some research on writing sponsored posts beforehand, but I had told them I would have it done by Friday and it was already Tuesday so I got right to work! The first thing I did was go to their website to gather facts about the product. I started writing and I had quite a bit written when I decided I needed to start over. I had taken a bit too much information from the website to relay in my blog post. This is bad for a few reasons. First, it will look bad when the reader clicks through to the website to find all of the same information. Second, I should be telling more about my personal experience with the product, why I love it, AND why my reader will love it too. I deleted about half of what I wrote, keeping only the highlights, and started over. I decided to answer a few basic questions, not necessarily about the product itself but more so about my opinion and experience with the product so far. Through the process I have also come up with a list of important things to remember when you’re writing a sponsored post. You can read all of this below and it is also in the workbook for you to reference while writing your own sponsored post. What is the product? – Like I said, I kept this brief. They can go to the product’s website to learn ALL of the facts, I wanted to get to my experience and opinion. How did I discover this product? What was my first impression? – I think this is important because it starts the narrative and humanizes your experience with the product, instead of sounding like an infomercial. What do you love about the product? – You wouldn’t be endorsing the product if you didn’t love it. This is your chance to rant and rave about your personal experience. What sets it apart from similar products? – This might not be relevant for every product but I reviewed a learning to read program and there are TONS out there. This section goes a little back into the facts of the product, but coming after your opinion i feel it makes it more personal. Why should your reader buy this product?/Why do you believe in it? – Back to your opinion. Almost combining the last two questions and re-wording your answers a little bit. Keep it heartfelt and not too salesy. How has the product changed your life? – This is your closing paragraph and your chance to give a true testimonial. Again, you might just be rewording and reaffirming what you have written above. Have a clear title telling everyone what the product is that you are endorsing. Don’t be too sales pitchy. Keep the facts brief. They can find all of the facts on the product website, this post it mainly for your experience and how it relates to your reader. Give a genuine review of the product. Your readers will be able to tell if you say you love the product and you actually don’t. You want to build their trust, so make sure only to agree to review products you love. Tell your reader why they need the product. It’s really easy to go on and on forever about a product you love and why you love it. But your reader wants to hear why THEY will love it. So tell them how it can benefit them. If the sponsor has any requirements at all, be sure to meet them. Make sure your photos in the post and any promotional photos are top notch. I used 100% of the photos they provided because it was such a short deadline and I didn’t have time to take great photos. I plan on adding my own photos soon! Be on time. If a deadline has been set, make sure to meet it or even finish a little earlier than planned. Go above and beyond. When I emailed the sponsor to let them know I was done and sent them the link, I also let them know my promotional plan for the post. This included the regular facebook shares and Pinterest pins, but I also said I planned on purchasing another kit to do a live unboxing video on facebook as well as some live product usage videos. The sponsor was THRILLED to hear I had so many plans to continue promoting the product. Go find your sponsored post opportunity! I really enjoyed the process of writing my first sponsored post. I’m excited to do it again now that I’ve gone through the process once and refined this method. Next time I will be searching out a sponsored post opportunity, instead of waiting for it to find me. I’ll be writing a post on my experience finding sponsored post opportunities soon! 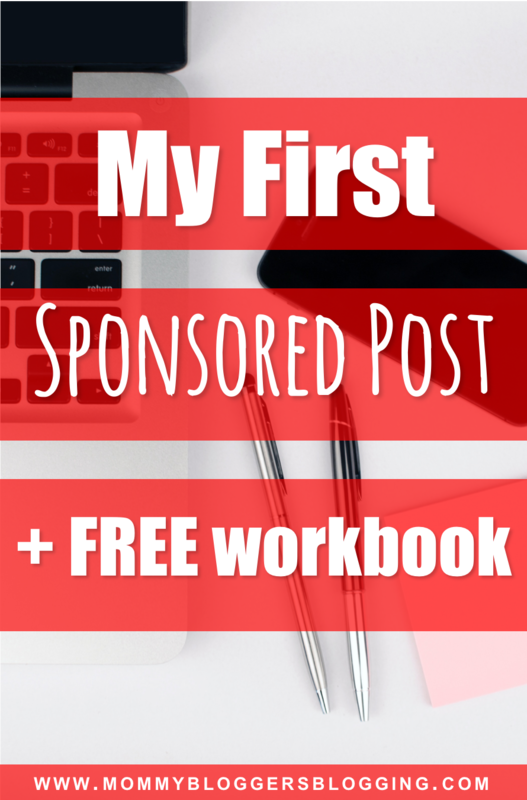 I will also be updating this post as I write more using my own sponsored post workbook.  I would love to hear your experience using the workbook, writing sponsored posts (whether you use the workbook or not), and finding sponsored post opportunities. Comment below or send me an email!